Sir Bernard Dudley Frank Docker (9 August 1896 – 22 May 1978) was an English industrialist. Born in Edgbaston, Birmingham, he was the only child of Frank Dudley Docker, an English businessman and financier. Docker was the managing director of the Birmingham Small Arms Company (BSA) group of companies from the early 1940s until 1956. He also chaired The Daimler Company Limited and the Anglo-Argentine Tramways Company. He became noted during the 1950s for producing show cars, such as the "Golden Daimler" (1952), "Blue Clover" (1953), "Silver Flash" (1953), and "Stardust" (1954). He was succeeded by Jack Sangster as Chairman of BSA, following a 1956 boardroom coup. He also served as the chairman of the British Hospitals Association. Docker's first wife was Jeanne Stuart (née Ivy Sweet), a British actress. They married in 1933, but the marriage was soon dissolved after pressure from Docker's parents. His father had her tracked by private detectives, and after finding her with actor David Hutcheson, Docker divorced her. MY Shemara seen at Southampton Docks. Docker commissioned John I. Thornycroft & Company to build a yacht to his specifications. The yacht was completed in 1938 and christened MY Shemara. Docker commissioned Hooper & Co. to build a drophead coupé on a Daimler DE-36 chassis for display at the first post-war British International Motor Show at the Earls Court Exhibition Centre in 1948. Named the "Green Goddess" by the press, the car had five seats, three windscreen wipers, and hydraulic operation of both the hood and the hood cover. After the show, the car was further tested and refined, after which it was kept by Docker for his personal use. Six other chassis were bodied with similar bodies. These were all called "Green Goddesses" after the original, which was exhibited with jade-green coachwork and green-piped beige leather. His second wife was Norah Collins (née Norah Royce Turner), a former showgirl that he married in 1949 as her third husband. She was the widow of Sir William Collins, the president of Fortnum & Mason, and also the widow of Clement Callingham, the head of Henekeys wine and spirits merchants. The Dockers were often objects of ridicule because of the ostentatious flaunting of their wealth. In the 1950s, they bought and lavishly redecorated Glandyfi Castle in Wales. The comedian Frankie Howerd often referred to people as "looking a bit like Lady Docker". Sir Bernard Docker commissioned a series of Daimlers that were built to Lady Docker's specifications for the show circuit. The Gold Car was a touring limousine on the Thirty-Six Straight-Eight chassis. The car was covered with 7,000 tiny gold stars, and all plating that would normally have been chrome was gold. This car was taken to Paris, the United States and Australia. 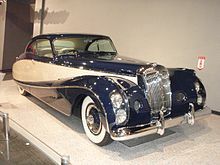 Also on the Thirty-Six Straight-Eight chassis, Blue Clover was a two-door sportsman's coupé. The Silver Flash was an aluminium-bodied coupé based on the 3-litre Regency chassis. Its accessories included solid silver hairbrushes and red fitted luggage made from crocodile skin. The Golden Zebra was a two-door coupé based on the DK400 chassis. Like the Gold Car, the Golden Zebra had all its metal trim pieces plated in gold instead of chrome, and it had an ivory dashboard and zebra-skin upholstery. In January 1953, the chairman of Midland Bank asked Docker for his resignation from the board of directors. Docker, who had been a director of Midland Bank since 1928, refused to resign. The board of Midland Bank notified its shareholders that they were to be asked to remove Docker from the board at the annual general meeting being held that February. The chairman stated that it was not in the bank's best interest to be associated with the publicity surrounding Docker, who replied to the shareholders that the publicity stemmed from three court proceedings, all of which had been either settled or found in his favour. In late January, Docker resigned from the board of Midland Bank with immediate effect, claiming there was a rumour of an impending charge for a currency offence. At the end of May 1956, Docker was removed from the board of Birmingham Small Arms Company (BSA), and he was replaced as chairman of BSA by Jack Sangster. The company, which owned the Docker Daimlers, had the Dockers return them. The issues leading to the removal of Docker stemmed from the extravagant expenses he presented to the company, including the show cars made available for Lady Docker's personal use, a £5,000 gold and mink ensemble that Lady Docker wore at the 1956 Paris Motor Show that she tried to write off as a business expense as she "was only acting as a model" at the show, and Glandyfi Castle, bought with £12,500 of BSA's money and refurbished for £25,000, again with company money. Without their main source of income, the Dockers began to run out of money. In 1965, Docker put Shemara on the market for £600,000; it was eventually sold for £290,000. In 1966, the Dockers sold their estate in Hampshire and moved to Jersey in the Channel Islands, becoming tax exiles. Docker was placed in a nursing home in 1976, where he died on 22 May 1978. He was buried beside his wife's grave site in the Callingham family plot in the churchyard of St James the Less, Stubbings, near Maidenhead in Berkshire. Clement Callingham, Lady Docker's first husband, had been buried on the other side of her grave site. ^ "The modern day Docker". The Steeple Times. Retrieved 27 November 2015. ^ "British Hospitals Association". British Medical Journal: 644. 8 November 1941. Retrieved 6 June 2017. ^ Martin, Douglas (24 February 2003). "Jeanne de Rothschild, 94, Who Came From Stage, Dies". The New York Times. New York, NY USA. Obituaries. ISSN 0362-4331. OCLC 1645522. Archived from the original on 17 June 2013. Retrieved 7 July 2013. In 1934, she married the industrialist Bernard Dudley Docker. Mr. Docker's father was so upset that he hired private detectives to track his son's new wife. The son divorced her after discovering her with the actor David Hutcheson. ^ a b c Davenport-Hines, R. P. T. (2004). "11. Birmingham Small Arms 1918–44". Dudley Docker: The Life and Times of a Trade Warrior. Cambridge, UK: Cambridge University Press. pp. 231–233. ISBN 978-05-218940-0-5. Retrieved 13 May 2011. ^ "Info Page for Motor Yacht Shemara by JI Thornycroft & Co". CharterWorld.com. Charterworld Limited. Archived from the original on 28 June 2012. Retrieved 13 July 2013. ^ "Submarine Losses 1904 To Present Day – Page 8". Submarine Losses 1904 to Present Day. Gosport, Hampshire, UK: Royal Navy Submarine Museum. Archived from the original on 14 July 2013. Retrieved 13 July 2013. ^ a b "The 1948 London Motor Show, Earls Court Exhibition, ex-Sir Bernard Docker – from the Estate of the Late John H. Sweeney – 1948 Daimler DE-36 'Green Goddess'-'The Chairman's Car' – Registration no. LJJ11 (UK) – Chassis no. 51233". Bonhams. 14 August 2009. Retrieved 15 August 2013. ^ a b Delingpole, James (12 May 2007). "Castle for keeps". The Daily Telegraph. London, UK: Telegraph Media Group. ISSN 0307-1235. OCLC 49632006. Retrieved 7 May 2012. Sir Bernard bought it through the company for £12,500 and spent more than double that on doing it up at BSA's expense. When news of this got out, the shareholders revolted. ^ a b Palmer, Gerry; Griffiths, Jeff (1 February 2011). "Archaeology in Marlow: The Pink Champagne Lady". Archaeology in Marlow. Archived from the original on 7 July 2013. Retrieved 7 July 2013. Following on writing the above article on The Pink Champagne Lady in the last more information has come to light on Nora, Lady Docker. She actually rests there alongside two (out of her three) husbands, one on either side of her, at the east end of the church. ^ Sewell, Brian. "Brian Sewell's Docker Daimlers". Brian Sewell. Retrieved 9 September 2017. ^ "Daimler: extravagant design and magnificent bodywork". The Independent. London, UK: Independent Print. 10 February 2004. ISSN 0951-9467. OCLC 185201487. Retrieved 25 May 2012. Nora's first design, of 1951, was known as The Gold Car, a limousine embellished with 7,000 gold stars; from bonnet to tailpipe all that should have been chrome was gold, and the interior was trimmed in golden camphor wood and gold brocade. ^ Lewin, Tony; Borroff, Ryan (2003). "03.04 The Ten Best Forgotten". How To: Design Cars Like a Pro: A Comprehensive Guide to Car Design from the Top Professionals. St. Paul, MN USA: Motorbooks International. p. 181. ISBN 978-0-7603-1641-2. Retrieved 23 June 2013. Based on the Daimler Regency model, it sported slightly more restrained solid silver hairbrushes and propelling pencils built into the interior, plus fitted red crocodile skin luggage. ^ a b "632 The ex-London Motor Show 1955 Daimler DK400 'Golden Zebra' Coupé Coachwork by Hooper & Co Registration no. TYL 575 Chassis no. 92705 Engine no. 48771". Auctions at Bonhams. 4 December 2006. Archived from the original on 14 July 2013. Retrieved 26 May 2012. In 1966 Golden Zebra, which cost £12,000 to build (many times the value of the average semi-detached house at the time) was offered for sale by Daimler distributors Henlys of Chester with 25,000 miles on the clock for only £1,400. ^ "Lady Docker's Golden Chariot". Mechanix Illustrated. Fawcett Publications. 52 (8): 49–51. August 1956. ISSN 0025-6587. Archived from the original on 27 June 2013. Retrieved 14 May 2012. Undaunted, Lady Nora (sic) ordered a Bentley Continental, also a plush job. Tutor, Chris (28 November 2006). "Auction Action: 50-year-old blingmobile on the block". AutoBlog. AOL. Archived from the original on 27 June 2009. Retrieved 26 May 2012. The four-liter coupe featured gold plated exterior trim, an ivory dashboard and, of course, authentic zebra-hide seats. When asked why she chose zebra, Lady Docker replied: "Because mink is too hot to sit on." ^ a b c "Sir Bernard Docker's Statement". The Herald. Glasgow, UK: George Outram and Co. 27 January 1953. p. 8. Retrieved 3 July 2013. ^ a b c d "Bank shareholders asked to sack the millionaire who won't resign". The Argus. Melbourne, Australia. 29 January 1953. p. 3. Archived from the original on 14 July 2013. Retrieved 20 May 2012. ^ "Proposed Change in Bank Board – Sir Bernard Docker". The Herald. Glasgow, UK: George Outram and Co. 24 January 1953. p. 6. Retrieved 20 May 2012. ^ "Fight Pledged: British Mogul Fired As Head Of Key Firm – Ouster Also Means Wife Must Forgo Her Gold-Trimmed Auto". Toledo Blade. Toledo, Ohio USA. Reuters. 1 June 1956. p. 31. OCLC 12962717. Retrieved 14 May 2012. The board of the Birmingham Small Arms Co.—key firm in a $70,000,000 industrial empire—announced that Sir Bernard 'has ceased to be a director.' The board gave no reasons for this, merely naming John Young Sangster as the new chairman. ^ a b Stepler, Jack (1 June 1956). "Wife's Spending Blamed – Sir Bernard Docker Bounced From Post". The Calgary Herald. Calgary, Alberta, Canada. The Herald's London Bureau. pp. 1–2. ISSN 1197-2823. OCLC 29533985. Retrieved 14 May 2012. ^ "Deaths". Calgary Herald. Canadian Press. 24 May 1978. p. C4. Retrieved 13 July 2013. ^ Bell, Glennys (28 May 1978). "Those Fabulous Dockers: A Flag Ended The Fun". Sydney Morning Herald. p. 56. Retrieved 13 July 2013. ^ "Sir Bernard Docker, 81; Bon-Vivant Industrialist" (Article preview). The New York Times. 24 May 1978. Retrieved 13 July 2013. This page was last edited on 14 March 2019, at 04:28 (UTC).